Kids these days can no longer relate to a traditional, jolly, old fat man in a red suit. 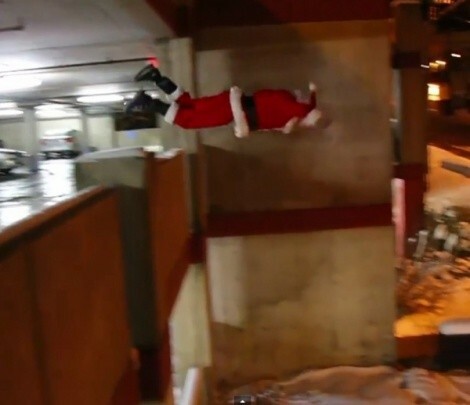 No, today's youth need an extreme Santa -- one who listens to dubstep, blasts through icicles and somersaults off tall buildings.--- Local stuntman Ronnie Shalvis, aka Ronnie Street Stunts, recently debuted his action-packed video Parkour Santa, which features the bearded saint flipping his way across Salt Lake City rooftops. Many of Shalvis' video have reached over a million views, and he was recently asked by the Italian car company Alfa Romeo to star in one of its commercials. But you've probably already witnessed Shalvis' skills in the popular Assassin's Creed parkour video, also shot in Salt Lake City in September 2012. Check out more videos from “Ronnie Street Stunts” here.